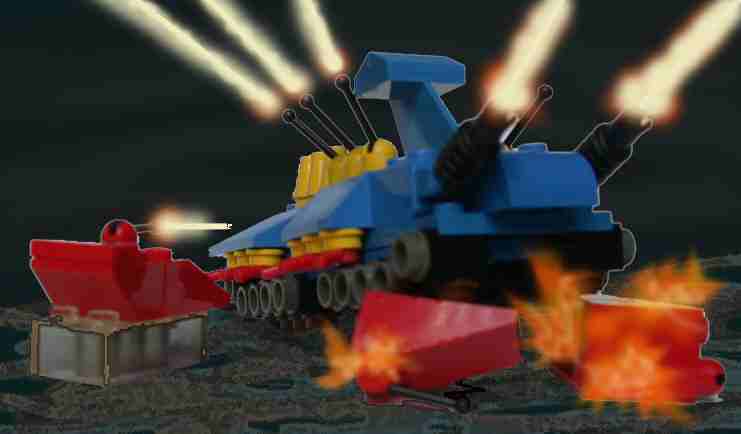 Don't miss my all-new version for 2011, LEGO G.E.V.! OGRE is a well-known "wargame" - a board game depicting combat between two armies. In a typical wargame, the armies are roughly evenly matched. 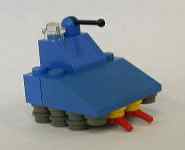 But in OGRE, one side has a mixed force of various futuristic tanks, hovercraft (GEVs, or Ground Effect Vehicles), infantry in powered battle armor, etc. 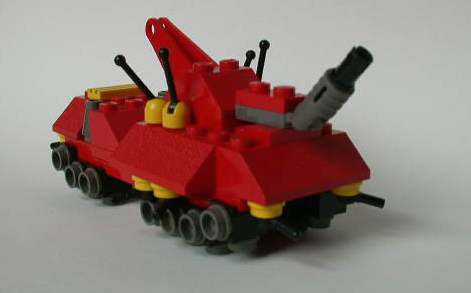 The other army consists of a single giant robot tank, bristling with weapons. This sounds like a neat idea for a game, and I'd always wanted to try playing it. But for years, I held off, partly because of the playing pieces. 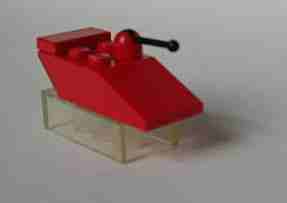 The original game used tiny cardboard squares to represent the tanks and such. These are a bit frustrating to use - they tend to fly around the board if you exhale sharply. That didn't seem like the ideal way to learn a game. These days, there are nice metal miniatures available too, but those are very expensive. Recently I wondered if there was some cheaper way to have three-dimensional pieces. Fold them out of paper? Sculpt them crudely out of polymer clay? A quick web search showed that these things can be done but the results may not be worth the time and effort required. I decided it would be better to adapt some existing objects that I already own, and that can be used for other purposes when I'm not playing OGRE. What, then? Icehouse pyramids? I like them, but I don't see a clear mapping to unit types. Coins? Not enough types. Monopoly houses? Not enough types. 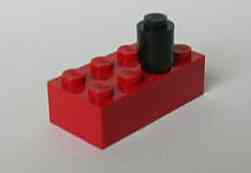 LEGO bricks? Aha! LEGO bricks are among the coolest toys on Earth. 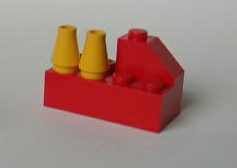 Little plastic bricks that lock firmly together with little pegs, available in a wide variety of shapes. They're pretty cheap, and I already had some. You can build almost anything with them. 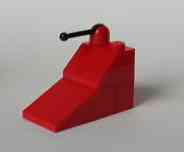 In fact, they have already been used as wargame miniatures, even by Steve Jackson, the creator of OGRE! But not for OGRE. Another quick web search revealed that, yes, people have built OGRE models out of LEGO bricks (I saw one here, but it seems the pictures have been taken down) - but these have been robots or simply models, not intended for use as playing pieces in the game. I started building. 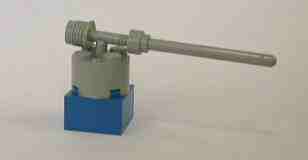 My first GEV was almost 2 inches long and used about twelve LEGO pieces. I realized that the size and piece count of the models would be critical. My goal was to have pieces that would be roughly compatible with official miniatures-scale maps, even if they were out of scale with the miniatures themselves. I also wanted them to be cheaper than the metal miniatures. If possible, they should use mostly parts I already had in my (relatively small) collection. What's the absolute minimum piece count for a LEGO model? One piece, of course. 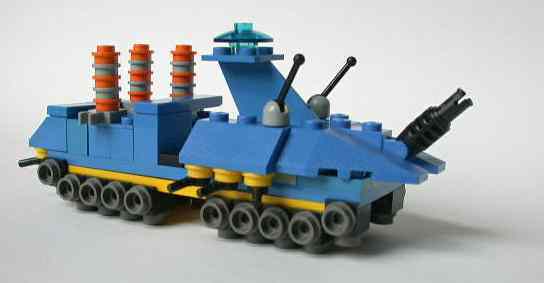 Could I find a set of LEGO elements such that each looks roughly like one of the OGRE unit types, and none of them look too much like each other? Yes, and they're not too far from the scale of the official metal miniatures. They fit in miniatures-scale map hexes. It can be done with just one piece per model, but I chose to allow up to two, so that my GEVs could have visible air cushions. And the OGRE itself should dominate the scene, so I allowed it a few more pieces. 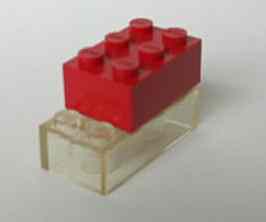 Thus, I had my solution: LEGO OGRE Basic. The OGRE itself - the giant cybernetic tank that gives the game its name - is a bit of a special case. It's supposed to be much larger than the other units, and it has more weapons - it's the only unit with a special scorecard to track damage to its components. 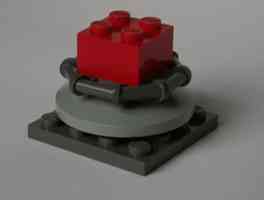 My Basic version is four pieces, and like the rest of LEGO OGRE Basic it's not far from the standard miniatures scale. Thus, the Deluxe OGRE model doesn't have a piece count maximum like the other units. It has a piece count minimum - one piece per scorecard check-box. The OGRE is available in numerous configurations; I chose to model five of them. I'm quite happy with how these models turned out. I showed them to Steve Jackson at a gaming convention, and he liked them too. At that same convention, I also got to play in Evil Stevie's Pirate Game and I finally played my first actual games of OGRE - with metal miniatures. But I still haven't used my LEGO OGRE pieces in an actual game of OGRE. These instructions allow for some variation - feel free to customize, but try to stick to the "one piece per record-sheet check-box" idea, and try not to use a lot of pieces overall. All pieces should usually be the same basic hull color (or camouflage scheme, etc. ), except as noted below. 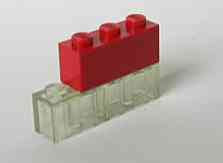 Make 20 tread triples (each a 1x1 "headlight" brick with two 1x1 round plates inserted into the back and bottom). These should probably be done in metal, rust, and mud colors. Connect the "headlight" (front) studs of these units to the bottom of the plates - four on the corners of the upper plate, the rest next to those in four groups on the bottom plate. 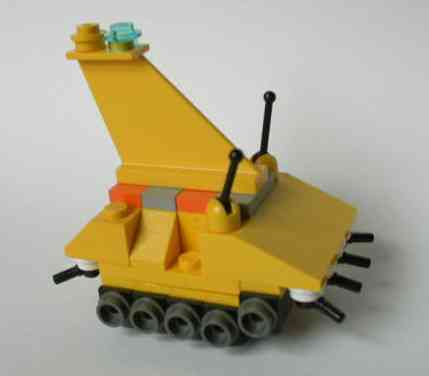 The lips on the headlight bricks should overhang the hull plate edges. The main guns are click hinge bricks or plates in the hull color, plus black or grey click-finger-to-peg connectors (or click-finger-to-axle connectors, or something else with about 1-3 pieces per gun that looks right to you). 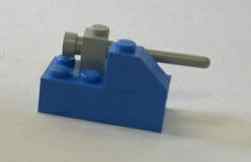 The secondary guns are made with the relatively modern "small lever" piece, in either the hull color or a contrasting color. Missiles are 1x1 cones in a contrasting color. 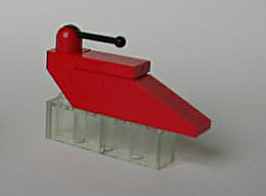 The Mk IV's missile-rack missles are 1x1 plates, preferably in bright alternating colors. 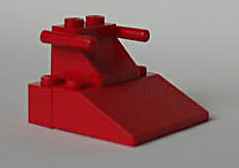 A missile rack is ideally a 1x1 plate with some kind of clip sticking out (for leverage) on top of a 1x2 hinge brick. It folds down most of the way into the hull with 5 mini-missiles loaded, but is stopped by the unoccupied half of the next missile rack's hinge brick, on the other side of the hull. The AP guns, attached to the bottoms of overhanging hull slopes just above the treads, are minifig hands (!) plus 1x1 round plates. (The outside of the minifig "fist" acts as a stud.) Use colors that contrast with the treads for at least one of the components. You may need to move some tread units aside to position these, depending on the upper hull shape. 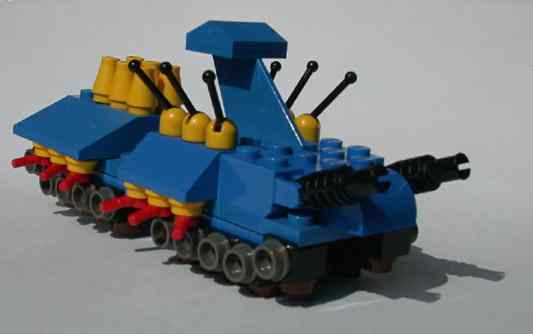 The upper hull is a two-lobed shape made of your choice of sloped and curved bricks in the body color, such that (a) there's room for all the weapons plus some kind of conning tower; (b) it's not much bigger than the lower hull; (c) it looks something like an OGRE, and (d) it looks at least as cool as mine. The conning tower is some kind of tail-fin construction, about 1-3 pieces, plus some kind of dome or "electronic eye" or "sensor package" on top. Feel free to add a few decorative tiles on unused studs to smooth out the lines, to "shadow" the groove between the fore and aft lobes, for color contrast, or for general aesthetics. I did. LEGO® is a trademark of The LEGO Group of companies (creators of LEGO building toys). OGRE® is a trademark of Steve Jackson Games, Inc. (publishers of the OGRE series of games). This web page is not in any way affiliated with, sponsored by, or endorsed by either entity. And don't let the capitalization fool you: my term "LEGO OGRE" is not itself a trademark or brand; it's simply a descriptive name for the idea presented on this page. My name is Dan Efran. I build stuff out of LEGO bricks sometimes. It's fun. I do other things too - check out the rest of this gallery for more examples. I can be reached by email at embassy@efran.org. Copyright ©1999-2011 by Daniel S. Efran. All rights reserved.